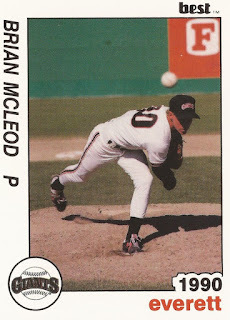 Brian McLeod came into that June 1990 game in relief for Everett, staying in long enough to face 16 batters. He stayed in that long because he was effective, setting down eight of those batters on strikes and allowing just one hit, according to The Seattle Times. "That's what you want from a reliever," McLeod's manager Deron McCue told The Times after Everett came back for the win. "He let us get back in the door. And we got the fans back into it, too. I knew we could score some runs." McLeod was pitching for Everett, having just been taken by the Giants in the 44th round of the draft, out of Orange Coast College. After that solid start, though, McLeod went on to a professional career that spanned just four seasons, McLeod reaching high-A, but never getting close to the majors. McLeod started his pro career that year with Everett, getting into a total of 22 games, starting two. He ended up winning two and losing five, posting an ERA of 4.56. For 1991, McLeod pitched between Everett and single-A Clinton, posting a 6.62 ERA between them. He had a rough outing in late July, giving up five runs in three innings. He had another rough outing earlier in the month, walking three. It was in early July 1991 that McLeod returned to Everett from Clinton, to fill staff holes, but also to work in control issues, according to The Times. McLeod moved to high-A San Jose for 1992, getting into 29 games there, posting a 6.66 ERA. He played just one more season, 12 outings back at San Jose for 1993, two with independent Sioux Falls, ending his career.